Kona Reef F26, is the sole owner of the information collected on this site. We will not sell, share, or rent this information to others in ways different from what is disclosed in this statement. , collects information from our users at several different points on our website. A credit card processing company is used to bill users reservations. These companies do not retain, share, store or use personally identifiable information for any secondary purposes. This web site contains links to other sites. Please be aware that we, Kona Reef F26, are not responsible for the privacy practices of such other sites. We encourage our users to be aware when they leave our site and to read the privacy statements of each and every web site that collects personally identifiable information. This privacy statement applies solely to information collected by this Web site. Thank you so much for the wonderful stay in your beach home. This house is wonderful. We had been comfortable, enjoyable, and great time. We will visit again, Kona and your beach home. Escape to tropical paradise at this 1-bedroom,1-bathroom Kailua-Kona vacation rental condo! Sleeping up to 4 guests, this fully furnished home boasts an ideal oceanfront location along with resort features including a pool, hot tub, charcoal grills, and more. Surf at Honl's Beach, snorkel at Keauhou Bay, and feast on delicious local food, all found within minutes of the home. In the evening, relax on the private lanai while watching the sunset over Kahului Bay. Plan your Hawaii getaway today! Ocean trade winds are the lovely natural breezes that serve to calm the body, mind, emotions, and spirit. Whether one sits on the lanai taking in the full benefit of this natural soothing, or indoor, with windows and doors in the opened, you benefit from a kind touch from the wind. Add to this mix focused deep breathing, you cooperate with a gentling that helps to repair stress. Did we mention the sound? The auditory refreshment of the waves breaking on the bed of lava rock adds to your restoration. Those frayed dispositions from the rush of life back at home are quieted, comforted. Open windows and doors insure you can be soothed by the sound of ocean waves, even as you drift off to sleep. For these reasons, as well as the exorbitant cost of island electricity, we welcome you to rest and restore with nature’s own resources. Our condominium view overlooks the pool, hot tub, and a stretch of green grass. Ponder the view. You get to choose from a feast of options: enjoy quiet beauty from home, play or sunbath either by the pool or closer to the surf with a book of your choice… or another nap. Over view overlooks the pool and hot tub with the sights and sounds of the Pacific directly behind the pool. Lawn chairs on the grass, beside the beach, are available for you to sun, relax, nap, or read. 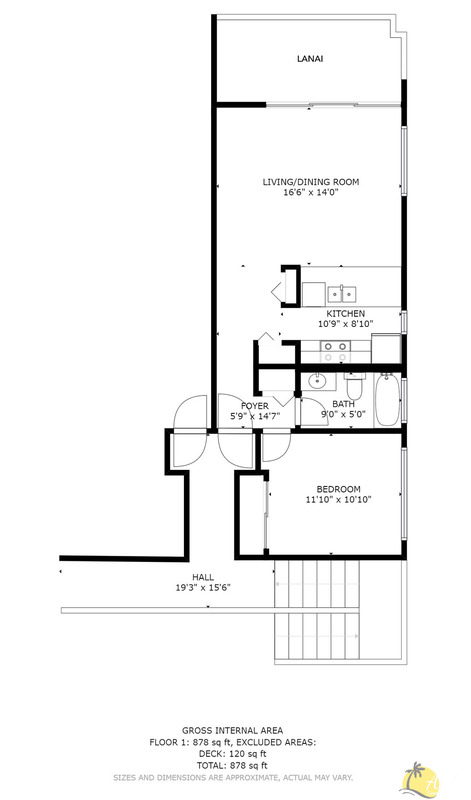 The condo lanai extends the full width of the apartment. Up to four guests can enjoy outdoor dining pleasure along with swivel, comfortable chairs and an outdoor ceiling fan. A communal barbecue is available below in the pool and hot tub area. The living room/dining room combination has a queen-size sleeper sofa bed, two comfortable lounge chairs, flat screen TV with DVD player, and a stereo system with CD player. The living room leads to the open lanai with sliding glass doors and screens. Books and movies are in the drawers of the entertainment center. There’s a dinette area with a table that seats 2, plus two bar stools at the kitchen counter. The large kitchen counter allows for eating, or making an easy access between the kitchen and lanai for outdoor eating pleasure. You’ll find the spot that suits you best. The large galley kitchen has a full-sized refrigerator, flat top stove, oven, microwave, dishwasher and comes fully equipped with cooking pots, pans, plates, and silverware. Drip coffee pot and rice cookers are also provided. A condo-sized washer and dryer are located in the kitchen area behind bi-fold doors. Extra pool and beach towels along with a complete first aid kit are in another closet across from the laundry area; laundry soap is provided, along with dishwater detergent and hand soap. We ask your help in separating whites from colors (if you wash condo supplies of towels or sheets). Our unit has one large bedroom with a California king size bed, flat screen TV and a large closet with memory foam inserts for the pull-out sofa bed in the living room, for added comfort (in top of closet). A hotel-style safe is in this closet as well. The bedroom cools down nicely in the evening with the windows open and the use of the ceiling fan. The bathroom has a shower, tub, and a single-sink vanity. There is a mirror and hairdryer. Once inside, look around. As you unpack, you’ll get familiar with the space that will be home. To the right of the entry way is a closet. We have placed storage items for housekeeping there. In addition you will discover an iron and ironing board, play equipment--buggy boards, inflatable air mattress, snorkel equipment, beach toys. The bedroom closet has shelving, a safe, and a beach canvas shelter tent on the top shelf for our guests to use. Our condo is located in the only one of three buildings that has direct elevator access from parking lots to the unit. It is handicapped-friendly. It is also a short walk to Kona’s downtown restaurants and activities, Honi’s Beach next door, drug store, post office, movie theaters, service station, and more. After 30 years of traveling to Kona this is one of the nicest condos we’ve stayed in. Great location, oceanfront amenities, full Oceanview, nicely furnished, big tv, comfortable bed, lots of fans, air conditioning, and ocean breeze. Super convenient coded lock. We enjoyed our six days staying at this beautiful, convenient, and clean condo.Appreciate the beach chairs and umbrella.Walking distant to farmer market and restaurants. This condo was perfect for our family vacation. The views of the ocean were unreal, and watching the sunset from the lanai was amazing (and the fan out there made it so pleasant even at the hottest time of day). The location right next to Honl’s beach was perfect, our son was thrilled to be able to walk right over to the beach anytime to play in the sand and waves. We even saw turtles there twice! And having the pool right on site was great for when we wanted water time away from the sand. The furniture and beds (including the sofa bed) were very comfortable, then kitchen was well appointed and the entire place was lovely and homey. Having the beach supplies like towels, an umbrella and chairs was such a nice touch. And having a washer/dryer in the unit was a fantastic bonus. The location just can’t be beat. An easy walk into Kona (even for our 5 year old) meant we didn’t need to use our car often, and there are so many fantastic shops and delicious places to eat nearby. This place is a gem and we can’t wait to stay here again! We enjoyed 3 great weeks on the Big Island and staying in Condo F-26 was the perfect location to be at. Close to downtown and the Farmers Market while off the main drag for peace and quiet. The unit was well maintained and has everything you need. Being on the end and at the top gave you plenty of light and a refreshing breeze so that air conditioning was not needed much. The grounds are well maintained and a great view of the bay and activities that go on throughout the day. This condo is absolutely amazing. The view was phenomenal a straight shot of the ocean close enough to feel the breeze coming in. It was stock with everything we needed down to snorkeling gear and towels for the beach. I would highly recommend it. How ever at the time of my stay there was some construction going on, but it was a terribly big deal. Wonderful condo, view and owners. A very nice condo fully stocked with toys and kitchen tools. Wonderful views from all of the rooms and lanai. Great cross breeze and excellent AC system. Very clean and organized. Owners were very attentive and relational. Excellent value! Kona Reef we feel is the absolute best location and we would definately stay at this condo again, if we're hadn't just bought one ourselves. Beautiful view of sunsets over the Pacific Ocean in a comfortable, breezy condo. Thank you so much for the wonderful stay in your beach home! We had such a great time at the beach and the pool with our two little ones! Your view here is amazing from the lanai with the ocean and the sunset. We couldn’t have asked for a better view! We loved seeing all the boats and helicopters flying by. We particularly enjoyed easing on the lanai, swimming in the pool, and walking right out to the ocean for some wadding. We had a wonderful time here on our first big vacation with the kids! Thank you again! The owners were very welcoming, accommodating, and responsive. We would love to stay at this property again in the future. Thank you for the stay in your condo. My friend and I came on this trip to allow to take a step back from working over 80 hours a week. Waking up to coffee on the balcony was exactly what I needed. I have been to the Big Island six times over the past 3 years and this stay was even better than the others! I hope to bring my family back for the Holidays to create some more amazing memories. Everything was perfect at our condo. Thanks again for everything.